This post explains, how to write a program to print Fibonacci Series in java programming language. In Mathematics, Fibonacci series next number is the sum of previous two numbeprs for example 0, 1, 1, 2, 3, 5, 8, 13, 21, 34, 55 etc. The first two numbers of Fibonacci series are 0 and 1. If you observe the above pattern, First Value is 0, Second Value is 1 and the subsequent number is the result of sum of the previous two numbers. For example, Third value is (0 + 1), Fourth value is (1 + 1) so on and so forth. Let's see the Fibonacci series program in java without using recursion. Let's see the Fibonacci series program in java using recursion. 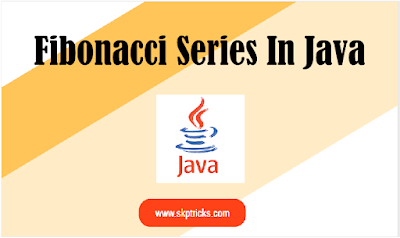 This is all about Fibonacci Series in Java. Thank you for reading this article, and if you have any problem, have a another better useful solution about this article, please write message in the comment section.